General Henry Harley Hapâ€ Arnold is widely considered the father of the United States Air Force. But his long list of accomplishments doesnâ€™t begin or end there. He was also the first and only five-star general of the US Air Force; one of the first US military aviators; the first... read more American to carry air mail; and the architect of the war-winning air strategy of World War II.In this new biography of one of the American militaryâ€™s most towering figures, author Bill Yenne weaves the story of Hap Arnoldâ€™s life, from his youthful days as a cunning prankster to his sunset career as an elder statesman. All along, Yenne unfolds General Arnoldâ€™s life like the adventure story it is. 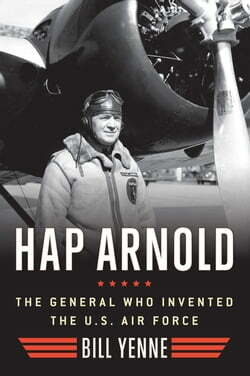 A bold advocate for technological advancement, Hap Arnold was a powerful character in the golden age of aviation, an innovative warrior in the conflict that defined the modern era, and the creator of an entirely new branch of the US military.Hap Arnold: The General Who Invented the US Air Force is a page-turning adventure biography for history buffs, aviation enthusiasts, and anyone interested in the events that shaped America and the world in the first half of the twentieth century.